This spring we traveled to Asheville, North Carolina. The manager of the B & B we were staying at suggested we try Posana Cafe for dinner. She mentioned how incredibly wonderful the food was, it was a gluten free restaurant, and she now craves their kale salad and must have it on a regular basis. While we aren’t gluten free, I find restaurants fully committed to being gluten free usually have wonderful, fresh, and novel approaches to the food they serve. So, off we went to Posana. Since my surgery last fall, my pipes (as I refer to my newly connected Crohn’s free intestinal zone) are working the best they have in years. I am eating foods I had long ago given up, and trying foods I have never eaten like kale. 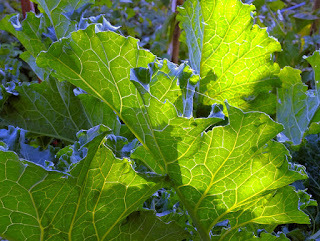 While kale has been around gardens and local grocery stores for years, it's the cool kids food of the moment. With the fact there are more interesting ways of serving kale than ever before, and the health benefits of eating it regularly are nothing short of amazing, I now add kale to my morning smoothies in small amounts and slice it sliver thin to add to salads. But I have never had a fully kale salad as I was unsure about all that fiber and how it would move through my pipes. Since I found the craving of kale comment rather interesting, I thought I better try this Posana salad. So I did, and now I crave Posana’s kale salad, too. I found the recipe for the crave worthy salad on-line and can eat it whenever the mood strikes. I know - how can anyone crave the rather firm, hard to digest kale with a slight cabbage flavor? All I can say is the executive chef at Posana knows food and knows how to do magic with kale. Since I have prepared the recipe almost weekly since our visit to Posana, I understand how the flavors work. First off, remove the hard center rib from each leaf, slice kale very thin and chop-chop to incredibly small pieces. Then, with your hands, massage olive oil and fresh lemon into the green chopped mixture. This process breaks down the firm kale leaves, imparts a light lemon flavor, and since you have had your hands in the mix - helps you become one with your kale! The addition of Manchego (a firm, nutty tasting Spanish cheese), and toasted pumpkin seeds (I use toasted sliced almonds) is just what the green glob of kale needs to override any residual cabbage flavor. The pièce de rèsistance is the addition of dried black currants. Their intense raisin flavor along with their natural sweetness finish this kale salad in a remarkable, but crave worthy way. What’s this kale craze, or should I say kale kraze, all about? Consider kale a super food loaded with vitamins A, C, and K, calcium, iron, a great source of fiber, and, wait for it, protein! Wow, I know, right? I’m sure you are all quite excited over the possibility of kale in your life right now; okay, maybe not so much. But I just bet you will change your mind on kale when you try the Posana kale salad. Come on; be a cool kid and click the hyperlink to the recipe noted here. If you are ever in Asheville, stop by Posana Cafe and tell them hi for me! One last thing, you may be interested to know National Kale Day is October 7, 2015; party on!